Sharon is a Senior Marketing Director with Virtuity Financial Partners and uses a variety of financial tools to help individuals and businesses grow and protect their assets, manage debt, build wealth and establish comprehensive retirement plans. Additionally, Sharon teaches financial literacy through partnerships with local communities, nonprofit organizations, public schools, universities and businesses. Sharon is also the Principal Consultant at SDG Business Consulting. Sharon oversees the delivery of business support and risk advisory services. Our professionals have over 35 years of experience working with individuals, small businesses, corporate entities, and nonprofit organizations. Our primary focus is helping clients manage risk, improve operations and increase cashflow. From business formation to succession planning, we're here to help. You set goals, we help you pursue them. Learn from experienced associates with real-world experience, no previous degree or education required. Be your own boss, set your own hours, and create your own success with an exciting and rewarding career in the financial services industry. Be appreciated for your hard work and dedication as you assist others in working towards their finanial goals. Provide products and services offered by some of the most respected and trusted institutions in North America. Learn from experienced and successful associates with real-world experience, no previous degree or education required. Be appreciated for your hard work and dedication as you assist others in working towards their goals through responsible money management. 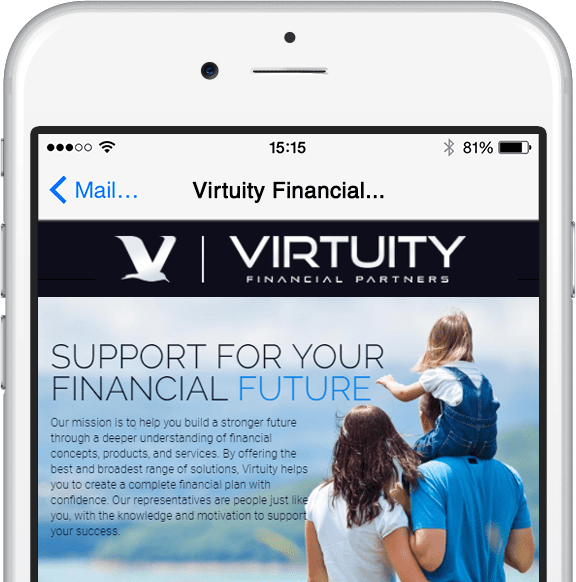 Make sure to subscribe to our email newsletter to stay current with the latest company news, upcoming events, and financial information straight from Virtuity Financial Partners. Don't miss out, subscribe today! Please select a convenient day and time to speak to Sharon Griffin. There is no charge to discuss your financial situation - speak with us today! Use the form below to schedule a meeting with Sharon Griffin. Please use this form to send a message to Sharon Griffin. Please allow one business day for a response. Use the form below to schedule an interview with Sharon Griffin. This material is intended for education and training purposes only and is not intended to be, nor should it be construed as, an offer or solicitation for the purchase or sales of any specific securities, financial services or other non-specified item. WFG and WFGIA are affiliated companies. Tax and/or legal advice not offered by World Financial Group, Inc. or their affiliated companies. Communications provided on this site and any linked site should not be construed as investment, tax or legal advice and should not be relied upon as such. Please consult your personal financial representative, tax professional or legal advisor for further guidance on your particular situation.